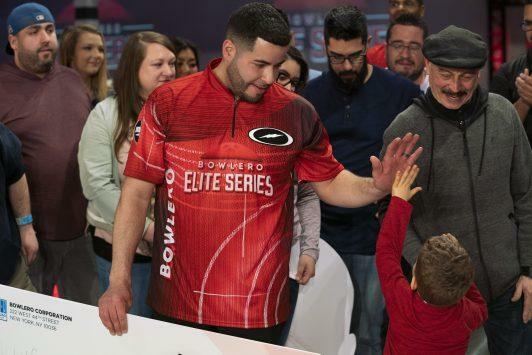 Luis Gonzalez, a league bowler out of Brunswick Zone River Grove in Chicago, Ill., defeated pro Kyle Troup to win the largest single prize in the history of competitive bowling in the inaugural Bowlero Elite Series (with wife Elisa and son Logan). The $270,000 awarded to Gonzales for his 237-226 victory over Troup in the single-game championship match of the inaugural Bowlero Elite Series, which aired on NBC Sports Network on April 9 after being taped at Bowlero Romeoville on April 2, amounts to the largest single prize check awarded in the history of competitive bowling. The closest approximation to that prize was awarded in 2011 when Mika Koivuniemi won the $250,000 top prize in the PBA Tournament of Champions. 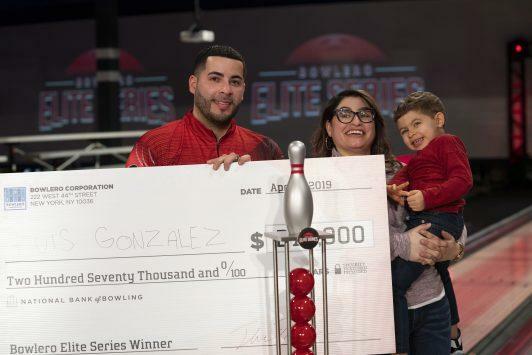 “It’s something that I never expected to happen,” said Gonzalez, a left-handed league bowler out of Brunswick Zone River Grove in Chicago, Ill. “I’ve put so much work into my game physically and mentally, and just to see it finally pay off is a big confidence booster for sure. “It helps me build a future for my family and son (3-year-old Logan), hopefully get a house and get him through school and some of my schooling,” added the pharmacy technician, who currently is earning a degree in business management. 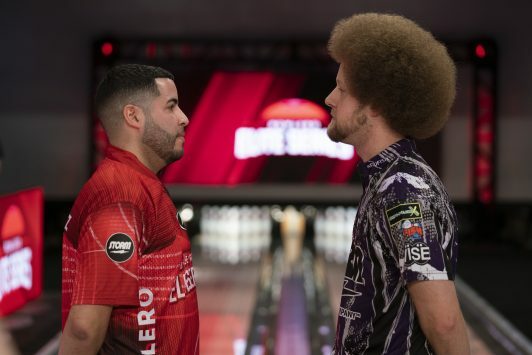 In a tight match that required Gonzalez to mark in his 10th frame to secure by far the biggest prize of his life as a bowler, he stepped up and tossed a strike. “I was pretty nervous,” said Gonzalez, who never before had bowled on television, “but I was trying to keep calm and stay focused and remember it’s just one shot at a time. All I was doing was breathing, just taking my time, and not thinking about too much other than just trying to make a good shot. 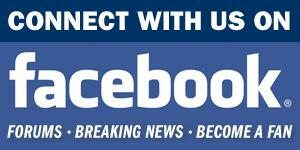 Troup, a three-time champion on the PBA Tour, certainly would have liked to seal the deal. His failure to do so lingered painfully with him for days. Kyle Troup (right), said his loss to Gonzalez was both "the worst loss of my career" and "the best thing that ever happened to me." “That was a life-changing moment right there,” said Troup, who took home $80,000. “I still won the most money I’ve ever won in one day, but I still had the biggest loss of my career. The thing that hurt me and what’s got me so upset about the loss — I’m fine now, but it took me three days to shake it — was that my family could have been set. If I win that extra $270K, then I can give my family some money, just thank them for everything and they don’t have to worry about anything. “My mother’s had cancer and once that happened, they were dealing with bills forever. That’s kind of how cancer works. Car payments or house payments, whatever it is, just to make it easier for them so they can relax. Whatever they would have used the money for would have been fine with me. “I mean, I don’t cry in bowling, but I cried for a couple days in a row whenever I stopped and thought about it for a second,” Troup added. He gave Storm ball rep and USBC Hall of Famer Tim Mack a call for some help changing his perspective on the experience. Perspective is precisely what he got. “I told him that he’s playing on house money because he’s one of the invites,” Mack said. “He didn’t lose anything; he didn’t have anything in the first place. He had everything to gain. Okay, you get to the title match, yeah, you want to win the big number. But he still made $80,000 for the week. That’s not a bad four games. Troup also had his mind on the PBA Playoffs in which he put on a fiery performance on FS1 on April 8 against Chris Barnes, whom he defeated to advance and bowl No. 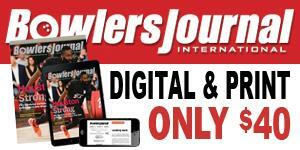 1 Jason Belmonte in the next round. Asked if losing to a so-called “amateur” necessarily made the loss any more bitter a pill for him to swallow, Troup said, “Yeah, I’ve seen comments and stories about how it’s bad for the sport. Honestly, that doesn’t matter to me. The guy’s good. He throws it good. If you watched the show knowing nothing about bowling, you wouldn’t be able to tell who was the pro and who was the amateur. It’s not like he’s a bad bowler. And honestly, he’s a lefty on a house shot. He’s gonna shoot a number. We all know it’s coming. Gonzalez said he planned to use his Bowlero Elite Series windfall to buy a house and put his son Logan (lower right) through school. Gonzalez agreed that the house pattern, along with being the only lefty to make the TV show when Faulkner lost his first-round match to Pajak, 268-235, both played to his advantage. “I made small adjustments with my ball speed, but I was able to stay in the same part of the lane the whole time,” said Gonzalez, who began bowling around age 3 when his father owned two bowling centers. In other preliminary matches in the event’s single-game elimination bracket, Rash defeated Belmonte, 258-227, Troup defeated O’Keefe, 258-227, and Anderson defeated McEwan, 290-255. Troup edged Rash in the second round, 268-249, while Anderson held off Pajak, 230-212, before losing to Troup 256-214 in the semifinal match of the professional bracket. In the amateur bracket, Gonzalez defeated Larry Chilton, 276-247, Kara Mangiola survived her match against Irene Wilson with a 219-214 victory, TJ van Gorden defeated Wes Soper (no relation to PBA Tour champion Butch) 223-194, and Tyler Troup, Kyle’s brother, lost to Alexander Jensen, 201-227. Gonzalez went on to defeat Mangiola, 235-214 while Van gorden defeated Jensen, 245-204, before losing the semifinal to Gonzalez, 235-192. Barnes handled color commentary along with NFL Hall of Famer and Pittsburgh Steelers legend Jerome Bettis, notably a lifelong bowler himself. NBC’s Todd Harris was on play-by-play duty. Amateurs were chosen to compete based on two factors: skill and personality. They were provided the opportunity to showcase those attributes for a chance to be selected by submitting a 60- to 90-second video along with an application. 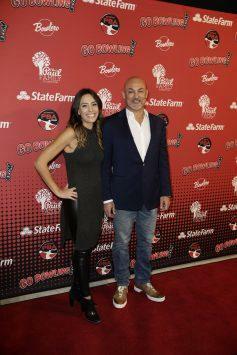 The eight pros also bowled upon invitation from Bowlero. Edison added that the BES “is going to show that a Bowlero league bowler can win, which is going to disrupt the sport a little bit, and we need to be ready for it. I think we have a lot of talented bowlers out there but somebody like Luis, he’s in school, he’s supporting his family, he’s a pharmacy technician. He can’t afford to stay on the road. He’s never going to get the chance to break through within the pro system. 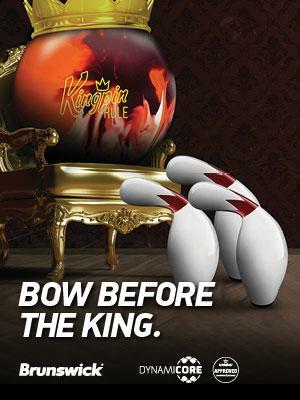 One way to achieve that disruption, Bowlero believes, was to go its own way with an event like the BES rather than invest the event’s generous prize fund in established tours such as the PBA or the PWBA.